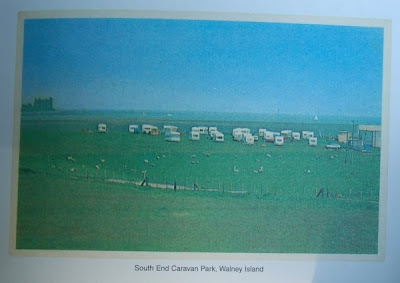 Infinite Art Tournament: Coffee Table Book Party: "Boring Postcards"
Martin Parr, Boring Postcards. Phaidon Press, 2004. The book Boring Postcards has a special place on the coffee table for Mrs.5000 and me. Not only do we find it strangely, sublimely hilarious in its own right, but it is also the book that inspired us to start our own collection (which has come up before, for instance here and here). 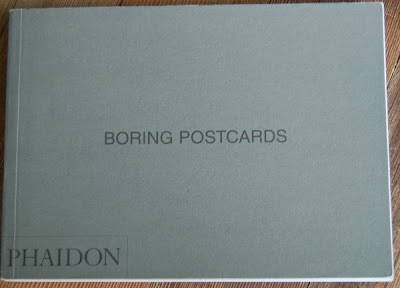 There is no text or interpretation in Boring Postcards. It is simply pictures of postcards -- boring ones. It is difficult to articulate why this makes interesting coffee table browsing. Perhaps it is just a specialized form of the fun of calling an "epic fail." Postcards, after all, are supposed to be interesting. They are supposed to be a product that the traveller can use to share or boast of his or her experience on the road. A boring postcard represents a breakdown in the system. Whoever sent it off to the printer, either through poor design skills, lack of interest in the project, or naive optimism about what constitutes a "place of interest," created a postcard that stands in parody of itself. Often, in their mingled hopefullness and wrongness there is a real pathos; you mourn for, say, the little town that seemed to think its bank would be a memorable site for the traveler passing through. But you are usually laughing, too. At least if you are me or Mrs.5000. 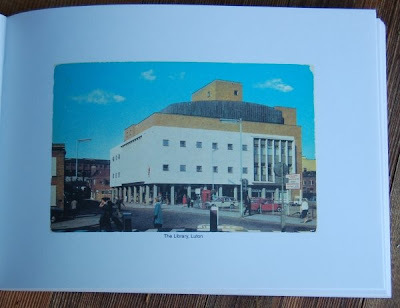 The postcards in Boring Postcards are British. You will also want to find Parr's two sequels: American cards are collected in Boring Postcards USA and German cards in Langweilige Postkarten. More postcard action coming at you for the next few weekends! LOL....I followed the link to YOUR boring postcards (hilarious) and then left a comment, totally missing that the link was to something from 2007. OK ... this is great! I love this idea. I think I need to have this book. The concept is downright hilarious ... and I love your description. I shall be on the lookout for them now! Since you post now and again about boring post cards I have kept an eye out when I go to buy post cards every two to three months to send home to the family or when I am at a new attraction I have not been to. I have to say finding boring post cards are hard, they are all so darn exciting. This was a really boring post.